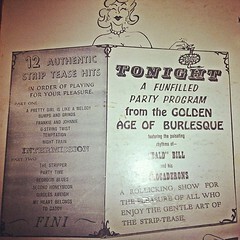 I brought in a few burlesque albums that once belonged to my Grandma Charlotte. It was good thing I did too, because we played them while we restarted the computer. And then we didn't have passwords and whatnot...so while everyone was listening to burlesque for 10-15 minutes, we were frantically making call after call and trying password after password. Eventually Bruce was able to get his show on the air, but still, it was a fiasco. And we left before we ever figured it out.